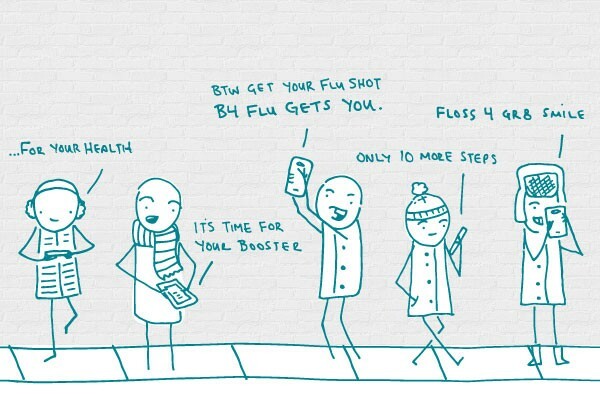 Hooray for Texting About Health! Given that we’re all glued to our phones these days, it’s no surprise that communicating about health (along with any other topic you can think of) is now happening via text message. Services like text4baby and smokefreeTXT are just a few of the campaigns paving the way for what will certainly become a more widely used health communication channel in the years to come. It also probably comes as no surprise that we have a lot of good things to say about texting for health. First, how often do we advocate for making health information accessible? Exactly. You can’t get much more accessible than someone’s pocket — which makes texting a great way to communicate about anything, health included. Second, text messages are inherently short, so you have to get right to the point. As with Twitter, there’s no room for all that nice-to-know information. It’s need-to-know only. And you know how much we love that. Third, texts are private — no actual human interaction required! This may be part of the reason why text messaging has proven effective in communicating about personal topics like sexual health. The bottom line: Text messaging services can be an effective way to reach your audience with the health information they need.